I am at something of a standstill with my second Emily2, as I need a much smaller steel crochet hook to add the beads. My current method using the dental floss thingy has become more than a little trying, and greatly detracts from the joy of knitting this shawl, and there is much enjoyment to be had in its creation. My lys does not carry any as small as I need, nor do any of the chain, craft stores. It does trouble me somewhat to double or triple the price of an item through shipping, so I am looking at one other option before I order online. Well, there is another, but that involves undoing all of my progress and getting different beads, and I really do not want to do that, but I will if I must. While working through the various solutions to the Emily2 problem, I have kept quite busy. I had a bit of mohair madness and wove a wrap for my nephew's teacher. I started it late Wednesday night, and needed to have it in gifting condition by Thursday morning. I used Moonlight Mohair in the Rain Forest colorway. I stayed up all night, and had it dried just barely in time. I think Opal crossing her fingers was just the extra boost I needed to make the deadline. I did not even have time to take a photo, but it was lovely, and I was pleased to have been able to give the gift. With one project on hold, and a gift on a tight deadline complete, I decided to play around a bit. I have not done much mitered-square knitting, but occasionally have been interested in the construction. I do have in my mind the idea to one day make the mitered square sock yarn blanket, but it is only a fleeting thought. With my hiatus from socknitting, as well as my aversion to knitting blankets, it has been quite some time since I last considered the project. Ah, but an opportunity to just play with leftover sock yarn and mitered square knitting, well, that has been fun. It is the opposite of much of the hurry and pressure of late, and I think I am making something good. It will just take a little longer to see if I have chosen well. When I finished Emily2, I looked about for the next thing to knit. Our weather was wonderful and unseasonably cool. I was loving it, especially because I knew that the heat would soon be here, and that October or later is probably the next time we might expect to enjoy such temperatures. Anyway, I was not quite ready to begin something new, but rather, I was of a mind to finish something that was waiting for its time to receive my attention. I first thought about Salt Peanuts, but I quickly let that go. I admit that part of the reason I did not finish it was the dreaded idea that I would have a new wool sweater just in time for hot, humid, oppressive weather to set in for the season. No sooner had thoughts of completing my cardigan been put back into hibernation, did the answer of what to finish next pop into my head. 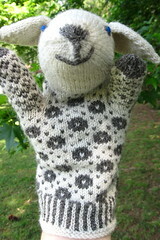 Within a few minutes, I was retrieving my nearly complete Estonian Sheep Hand Puppet. 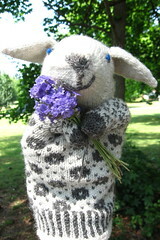 All that this little creation lacked was ears, stuffing, a face, and the weaving in of ends and blocking. In the midst of much on-the-go time, I grabbed a few minutes here and there, and soon I was done. After seeing just how little time it took for me to finish this, I could be a bit disgusted with myself for having put it off for so long. I recall what stopped me way back when. It was the missing portion of the directions for the ears. It just put me off, and so I set the project aside until I was ready. I am so pleased to have picked it back up and put in the time and effort to complete my new little friend. Much of my knitting of late has been for others, but this is for me. At least I think it is. Sometimes I hear that small voice or the little tap on my shoulder that lets me know something I made really belongs with someone else, and ignoring that leaves me unhappy. For now, though, this is mine, and it I am enjoying this simple hand puppet very much, possibly more than any one person should. Blogger is having temporary troubles. We will see if I can get this post to publish. In the meantime, I am watching wool dry and and have some finishing tasks that require attention. Since I jumped into it without understanding much, I decided that I needed a book to help me with my inkle weaving. Inkle Weaving by Helene Bress seemed to be the oft-most recommended books, so that is the one I chose. While I have been having a lot of difficulty with concentration lately, I kept flipping through my new book, looking at pictures, trying to read some, and finally I began to understand a little. 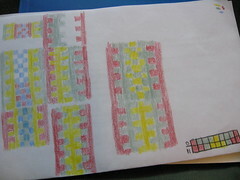 Next, I got out a sheet of paper and began playing with my colored pencils and a day or so later, I hoped I had properly planned a draft for the loom. 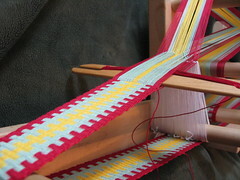 I love how the inkle loom looks when I have warped it. It seems very complicated and impressive to me (yes, I know I can be easily impressed at times). 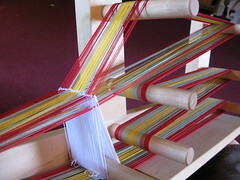 All of the color and order and lines speak to me, and I spend a little bit of time just looking at the dressed loom. Of course, it would be pretty pointless if I did not take it any further, so I got to the weaving and love how quickly my progress shows. However, the most thrilling was to see that I had been correct in my understanding of creating the draft, and that the pattern was working out the way I thought it would. A few months ago, my younger brother sent me a link in an email about crocheting an Android figure. I filed the hint idea away for future reference for gifting. Fast-forward to the news that he was about to finish his degree, and I knew I needed to get out a hook and some green yarn. I did not follow any patterns for this, but just looked at the shape of the Droid mascot and put my experience in crocheting amigurumi figures into play. It was a fun, simple, little project, and one that I am pleased to give my brother in honor of his graduation. If only getting a good photo of this little creature was as easy as crocheting it. Seriously, you would not think that this would be such a challenge, but it really was. There is so much I cannot quite sort out about the way I am feeling. 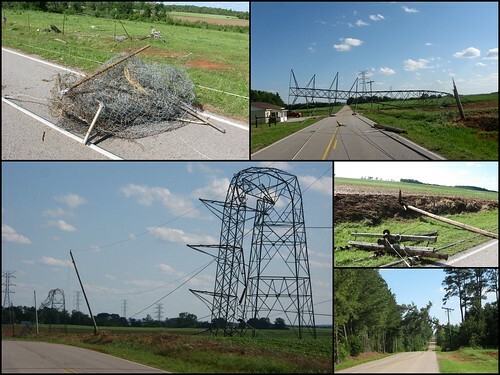 What I know for sure is that I am so very thankful to be fine, that my family was not harmed, and that all of our homes came through the tornadoes. The loss and destruction are tremendous and the images and stories overwhelming. We are trying to see where we can volunteer and be helpful, but mostly, feel useless. We are so pleased to be home again and pleasantly surprised to have electricity restored so soon.